IED involves recurrent episodes of impulsive, aggressive, sadistic behaviour or angry verbal outbursts in which one reacts grossly out of proportion to the situation. Domestic abuse, road rage, breaking objects, throwing things or other temper tantrums may be signs of intermittent explosive disorder. People with this disorder tend to attack others as well as their possessions causing bodily injury and property damage. The explosive episodes usually last less than 30 minutes and may occur in clusters or be separated by months or weeks of non-aggression. In between these explosive outbursts, the individual may be impulsive, aggressive or angry. The exact cause of this disorder is unknown, but it is probably caused by a number of environmental and biological factors. People with other mental illnesses such as anxiety, mood and personality disorders or certain medical conditions such as Parkinson's disease may also display aggressive behaviours. Nevertheless, these people would not be diagnosed as having IED as the cause is from another condition. 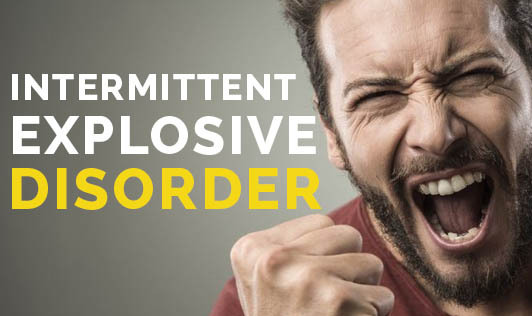 If you have any signs or symptoms of Intermittent Explosive Disorder, it is important that you get treatment as early as possible!